This is brilliant, Astrid...one of the best in your wonderful portfolio. Picturit: The museum created the opportunity and we gladly took it..
Oh this is great, Astrid!!! Wonderful idea and excellent execution!! Oh, how fun, Astrid. This came out BETTER than great! What a fun memory of our day with Escher. Very good Astrid: I like this! Picturit: Thank you kindly, Chris. We had fun making this. Picturit: You are so welcome, I am glad you like it, Claudine. this is a fun shot, Astrid. i love it! Picturit: Glad you like this, we had fun doing this. Picturit: We had so much fun. 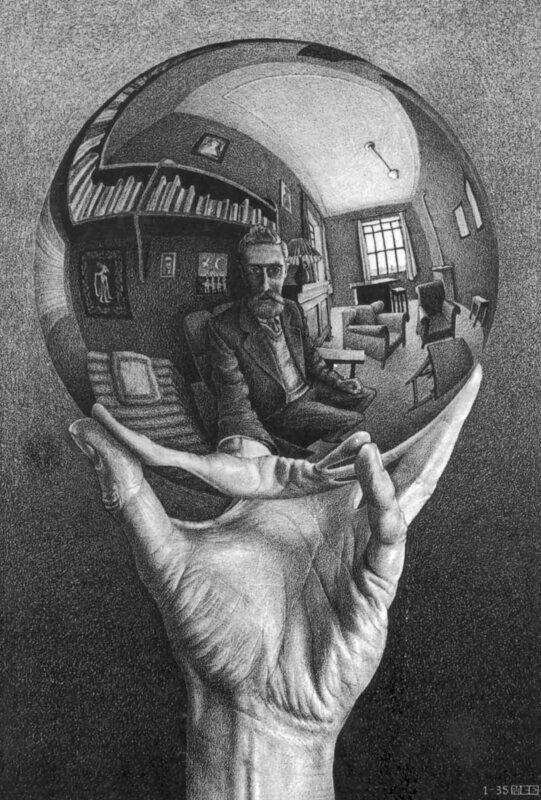 Escher is mind boggling. Wonderful and what a great portrait of you two. The mysterious person in the background reminds me of the painting - The Arnolfini Marriage. Picturit: I had to look up the picture of Arnolfini Marriage.. a famous picture, I have to say this is Escher. we had fun making and taking this picture. A little bit of playing Escher yourself (I read your reply to Ray). It does look fun indeed. It is also an excellent picture. Picturit: It was fun, Louis. And thank you for your nice words. Just shows how much fun one can get from being a photographer at times. How clever. Some exhibits are so creative in their interactive displays. I agree with all the comments. The photo is intriguing to look at and so well composed. Excellent! Picturit: Thank you for your kind words, Beth. This was fun doing. Picturit: Thank you, Cherry, sometimes you need to have some fun in a museum. Picturit: Thank you so much, JP. Picturit: Thank you so much for visiting and your kind words. What a fun "do it yourself!"